If you suffer from IBS, chances are you're very considerate of others and even possibly an anxious ''catastrophizer.'' It was repeatedly concluded based on magnetic resonance imaging of the brain and psychological questionnaires - for students and non-students, Easterners and Westerners, right-handed and left-handed individuals. In fact, IBS sufferers' anxieties are somewhere in between those of people with Crohn's disease (similar to healthy persons) and panic patients. And many IBS sufferers are convinced that social and occupational implications of their gastrointestinal symptoms are a catastrophe. As someone once said, catastrophizing is not just about watching slow German films or reading Russian literature and feeling as though life is an intolerable and senseless joke. If practiced properly, catastrophizing could make many things go wrong and create a reality around our worries and fears. Including fears focused on the gut. Because if you believe something will go wrong, you make it go wrong. But is it the personality that makes us susceptible to IBS or is it IBS that changes our personality? 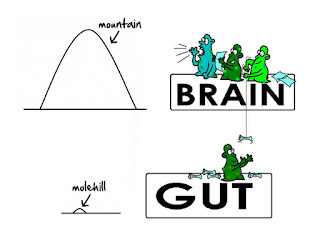 The connection between the brain and the gut is definitely bidirectional. So this question might be a chicken-and-egg problem. 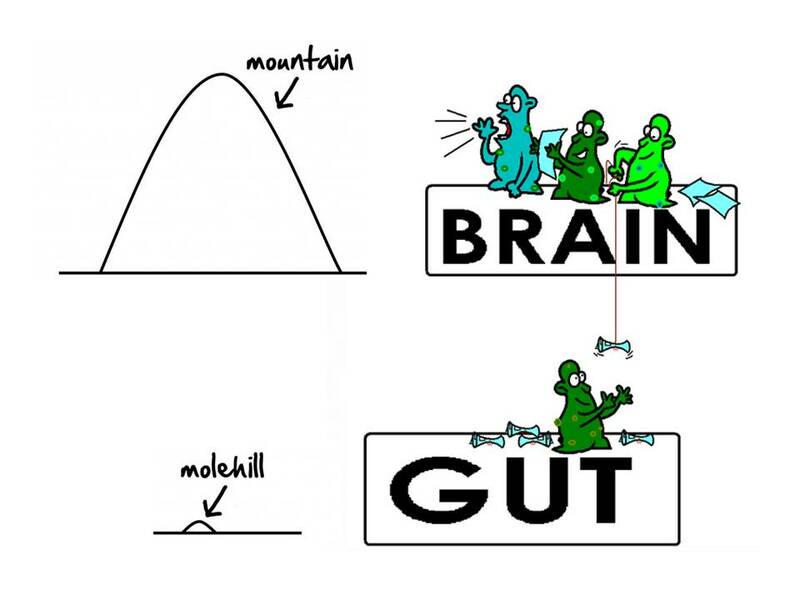 Animal studies suggest that perturbations of behavior, such as stress, can alter microbial communities in the gut. Experimental perturbation of the microbial communities, in its turn, can alter behavior. Getting rid of some microbes helped mice to reduce anxiety or even become bold and adventurous (after neomycin, bacitracin, and pimaricin antibiotics were administered to timid and shy BALB/c mice), while adding new species of bacteria such as Campylobacter jejuni made mice more cautious. Many recent studies indicate the possibility of discovering bacteria specific for different types of IBS. But you can make your own discoveries before science does. Such as the best diet, exercise and emotional attitude to cultivate the bacteria of success. Your result will be the last one in the table below. It might take up to 24 hrs for it to appear so please come back to see it. rumination (repetitiveness of focusing on the symptoms of distress), magnification (the degree to which you tend to magnify your symptoms) and hopelessness (the despair you feel when you have abandoned hope of comfort or success). Hazlett-Stevens H, Craske MG, Mayer EA, et al. Prevalence of irritable bowel syndrome among university students: the roles of worry, neuroticism, anxiety sensitivity and visceral anxiety. J Psychosom Res 2003;55:501–505. Ng SM, Chow KW. Symptoms catastrophizing versus social hypervigilance in irritable bowel syndrome patients. Soc Work Health Care. 2012;51(8):743-56. doi: 10.1080/00981389.2012.701001. Hunt MG, Moshier S, Milonova M. Brief cognitive-behavioral internet therapy for irritable bowel syndrome. Behav Res Ther. 2009 Sep;47(9):797-802. Epub 2009 May 20. Blankstein U, Chen J, Diamant NE, Davis KD. Altered brain structure in irritable bowel syndrome: potential contributions of pre-existing and disease-driven factors. Gastroenterology. 2010 May;138(5):1783-9. doi: 10.1053/j.gastro.2009.12.043. Epub 2010 Jan 4. Collins SM, Bercik P. The relationship between intestinal microbiota and the central nervous system in normal gastrointestinal function and disease. Gastroenterology. 2009 May;136(6):2003-14. doi: 10.1053/j.gastro.2009.01.075. Epub 2009 May 7. I totally believe catastrophizing is a serious medical "quirk" to consider, especially in the matters of occupational health. If people suffering from IBS tend to be catstrophizers too, it will cause a serious dent on their working capacity. Nice sharing.... i like Catastrophizer calculator easy to calculate..descriptive information. One simple way to eliminate those bacteria is to have a healthy diet and exercise. Studies show that by eating the right kinds of foods, it will definitely eradicate those bacteria. Big mountains have been instilled to the earth for the erection. All the activities of the nature have been looked after and is aussieessaywriter.com.au good is enough for the production of the material for the humans. The safety of the man has been upheld and intervened for the success of the people.